Mega Moolah might be an older title by Microgaming but it’s one of the most popular slots to ever be released! You can say Mega Moolah is a classic, as it’s still a favourite amongst player today! There are quite a few progressive jackpots out there, but Mega Moolah is consistently on the top of the list as one of the most played slots by players. So, what makes Mega Moolah such an unbeatable favourite? The answer lies in the fact that Mega Moolah offers not one, but four progressive jackpots! When you play Mega Moolah, you could be the lucky winner of a mini, minor, major or mega progressive jackpot! While the jackpots are huge, Mega Moolah still has a lot to offer other than the jackpots and you don’t necessarily need to hit the jackpot to win great prizes on Mega Moolah! Microgaming’s Mega Moolah is a 5-reel, 3-row title with 25 flexible paylines and a fun wild animal theme. The RTP is 88.12%. Besides four progressive jackpots, Mega Moolah comes with an exciting free spins feature where all wins during the free spins are multiplied by! It’s a simple, easy game, and more importantly, it’s super fun to play! You can play Mega Moolah with minimum bets starting at just € 0.25 and going up to the maximum bet of € 6.25 when playing on all 25 paylines. Start spinning the reels to meet all the quirky jungle animals residing in Mega Moolah; mighty lions, fat elephants, goofy giraffes, grinning antelopes, a laughing zebra and a smiling buffalo. The king of the jungle, the lion, is appropriately the wild in the game, substituting all symbols on the reels except for the scatter. Whenever a wild lion contributes to form a winning combination, it doubles your win as well! At least three scatters will earn you 15 free spins on Mega Moolah and all winning free spins are multiplied by 3x! Not only that, but you can re-trigger free spins again! The jackpots are triggered through a randomly triggered bonus where you’ll have to spin a wheel to win one of the progressive jackpots. You can win a jackpot at any time during the game, but the bonus feature cannot be won during free spins. Mega Moolah makes it possible to win prizes from the symbols during the base game, as the highest win symbols pay from just two symbols of a kind on a payline. The scatter, wild lion, elephant and buffalo require at least two symbols to earn you a prize, with the lion being the highest value symbol of all. The mighty lion pays between 15 to 15,000 coins, while the elephant earns you between 6 and 750 coins. The buffalo is worth a little bit less at a minimum prize of 4 coins and a maximum prize of 600 coins. Onto the medium value symbols, these are the giraffe, zebra, and antelope, in descending order. These will earn you minimum prizes ranging from 10 to 30 coins, and great maximum prizes between 250 to 500 coins. The playing card symbols are the lower win symbols, with the A being the most valuable, earning you a maximum of 150 coins. The K and Q will earn you a top prize of 100 and 75 coins respectively. The J and 10 are the lowest win symbols, worth a maximum 60 and 40 coins respectively. Besides the payouts from regular symbols, your eyes will of course be set on those jackpots sitting above the reels! You stand a chance to win one of four progressive jackpots in the randomly triggered bonus, and the higher your bet, the higher your chances of winning a jackpot! The jackpots increase as the game progresses, but all start at a fixed value. The Mini jackpot starts at € 10, the Minor progressive jackpot starts at € 100, and the Major starts at € 10,000. The biggest jackpot is of course the Mega progressive jackpot, which starts at a huge € 1,000,000 and goes up in value as you play! Mega Moolah has a really fun, vibrant cartoon design, featuring funny animals and bright colours in a jungle setting. Above the colourful reels bursting with colour and wild animals, you can see the value of all four progressive jackpots increasing as you play. As you spin the reels, Microgaming also sets the scene for you perfectly by playing typical jungle sounds in the background. Mega Moolah is still one of the most popular slots amongst players for a reason! It’s simple and fun to play, and the paytable is generous enough in itself. If you’re really lucky to hit one of the jackpots, you can literally win millions! 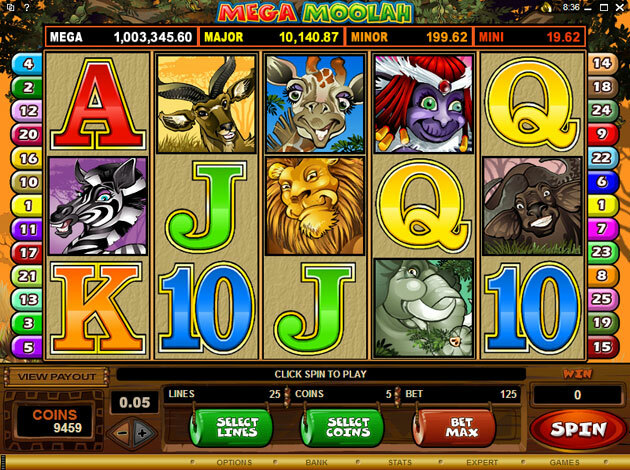 Step into the jungle and start spinning the reels of Mega Moolah at Videoslots now! Microgaming owns the largest progressive jackpot network in the world, having paid out over €848 million so far. In fact, in 2015, they earned the Guinness World Records title for the ‘Largest Jackpot Payout in an Online slot Machine Game’. This is a strong testament to the fact that players can benefit a lot when choosing Microgaming to do their online gambling! A few of the editions by Microgaming are Immortal Romance, Mega Moolah and Thunderstruck II. Check them out and more at Videoslots.com!